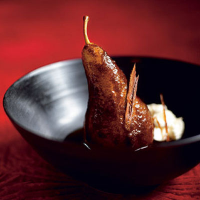 This fragrant pudding gives a twist to classic poached pears by adding a caramelised cinnamon sugar finish. Put the wine, 100g sugar, cinnamon sticks and vanilla pod in a pan with 225ml water. Bring to the boil, stirring to dissolve the sugar. Peel the pears, trimming the bases so they can stand upright. Add to the pan. Lower the heat, cover and simmer until the pears are tender (about 30 minutes), turning occasionally. Remove the pears with a slotted spoon and set aside. Boil the syrup in the pan for 20 minutes or until thick. Set aside. Meanwhile, mix 2 tbsp brown sugar with the ground cinnamon. In a frying pan, heat the butter until foaming, stir in the cinnamon sugar and roll the pears in the mix, letting them cook for about 5 minutes until they have a caramelised coating. Stand each pear in a bowl. Pour some syrup into each. Serve warm with Mascarpone and a glass of the white dessert wine.